This week I had all these plans for blog posts that I wanted to share..but life got in the way. 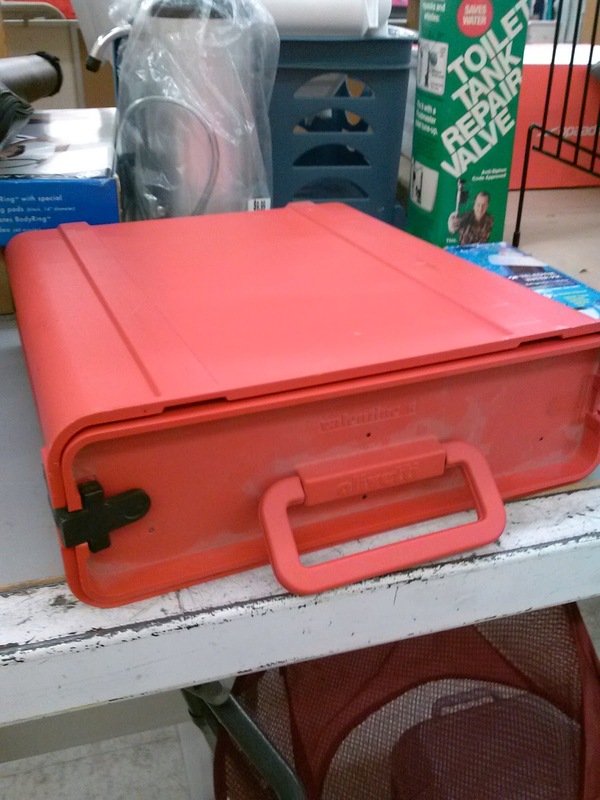 Then I went thrifting last night (one of my last chances to use a 30% off coupon at Value Village) and found something on my thrifting bucket list (it should have been on the written list…but it was only in my mental bucket list…must revise!) and knew I had to share this right away! 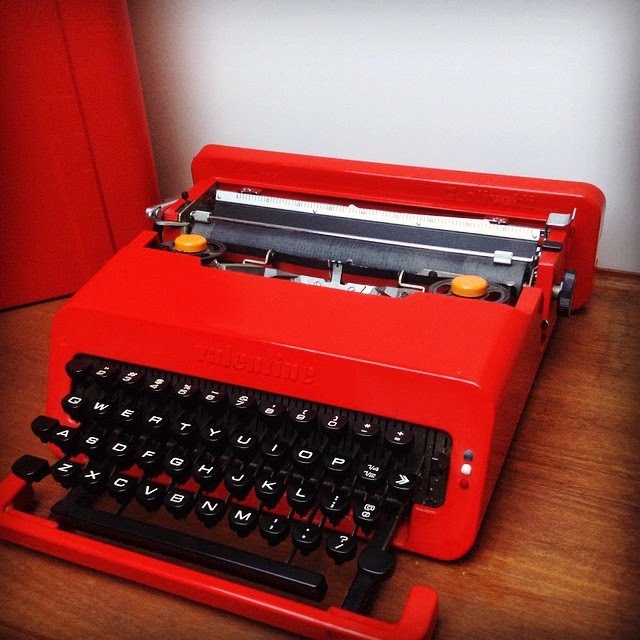 If you are a long time reader of this blog..you know I love me some typewriters. I really haven’t listed or sold any in awhile…I guess they’ve dried up a bit in my area. The ones with cool colors, anyway. I usually sell the ones I list and for a fairly good price. 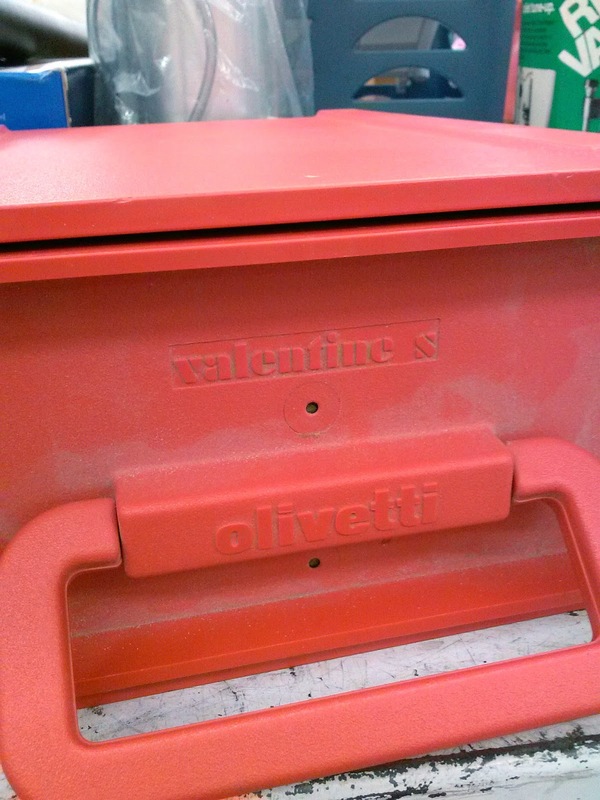 Well, I did sell an Olivetti before…it was a blue one. During my research of that…I came to realize that the one to REALLY look for was red. It’s called Valentine. It was designed by Ettore Sottsass and is featured in the Museum of Modern Art. So last night I headed to the thrift, and like most days when you have a coupon you HAVE to use…I wasn’t finding much of anything interesting. It got to the 15 minute warning that the store was closing and all I had was some outdated blank media and a few pieces of clothing for my boy. I was over in hardware and had found some drawer pulls for my hubby….I turned around and was perusing the tire chains and refrigerator water filters…really. I was standing there thinking about a filter I was looking at (just that day on Facebook, in the group Thrifting With The Boys – started by the Thrift Hunters duo from Spike TV…someone had mentioned refrigerator water filters) and I was thinking how I had already scanned that filter and dismissed it the week before…when my eyes wandered a bit. Really…I wish you could SEE my thought process during those felt-like-slow-motion 5 seconds. The case was open a bit and I just reacted. I slammed it shut!!! I think I was trying to hide it from the 2 tool hunting guys that were 4 aisles away. Then I took a couple pictures because I’m always thinking of you, dear blog readers. I’m still coming off the thrift-high. I’ve been sharing this all over my social media this morning so you may have seen it already. What do you think of it? Isn’t she a beauty? OMGosh that is beautiful. It is a shame you couldn't use it with your computer because it would make typing really cool. And it is really a modern piece of art!! Aren't coupons great? What a fantastic find! Lucky you!!! Oh dear Lord. This is magical. Congrats on the awesome find! Amazing find!! Congrats on being able to tick an item off your bucket list! Previous Previous post: Friday Find: Will Durant ~ The Story of Civilization 11 Volumes….and I Can Barely Write One Blog Post….